The Ecological Footprint Standards 2009 are the current operational standards for all Ecological Footprint assessments. We use them in all our applications, including those with our partners and clients. They are also informing our latest edition of the National Footprint Accounts. The 2009 Standards build on the first set of internationally recognized Ecological Footprint Standards, released in 2006, and include key updates—such as providing standards and guidelines for product and organizational Footprint assessments. The Standards have been developed through a consensus, committee-based process by a Standards Committee drawn from representatives of academia, government, NGOs, and consulting firms. As a Community Affiliate of the ISEAL Alliance, Global Footprint Network developed a standard-setting process in line with the approach lined out by the ISEAL Standard-Setting Code of Ethics and Good Practice. In order to promote the quality and integrity of Ecological Footprint Accounting, Global Footprint Network asks that all Partners comply with the most recent Ecological Footprint Standards. There is no certification process in place yet. If you wish, you can contract Global Footprint Network to review your work on its standards consistency. Why does the Footprint need Standards? A growing number of government agencies, organizations and communities are adopting the Ecological Footprint as an indicator. As the number of Ecological Footprint practitioners around the world increases, different approaches to conducting Footprint studies could lead to fragmentation and divergence of the methodology. This would reduce the ability of the Footprint to produce consistent and comparable assessments across applications, and could generate confusion. The value of the Footprint as a trusted sustainability metric therefore depends not only on the scientific integrity of the methodology, but also on consistent and transparent presentation of results across analyses. It also depends on communicating results of analyses in a manner that does not distort or misrepresent findings. To meet these goals, Global Footprint Network initiated a consensus, committee-based process for the development of standards governing Footprint applications, and for an ongoing scientific review of the methodology. Ensuring that Footprint results are both credible and consistent will encourage even more widespread adoption of the Ecological Footprint, increasing its effectiveness as a catalyst for a sustainable future. The Standards Committee was comprised of members drawn from the Network’s partner organizations, and representing academia, government, NGOs and consulting firms. The Standards Committee worked in conjunction with Global Footprint Network staff to establish the standards, which was then submitted for extensive public comment. 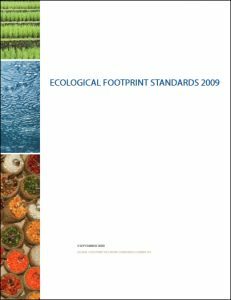 The Ecological Footprint Standards 2009 represent the result of months of discussion, consensus-building and review by stakeholders and Footprint practitioners.